Brooke Noble (b. 1979) received her B.F.A. from Syracuse University and attended Southern Illinois University in Edwardsville, Illinois for her M.F.A. Between degrees, she was a resident artist at three studio art centers: Vermont Clay Studio, Anderson Ranch Arts Center, (CO) and Bluseed Studios of Saranac Lake, NY. 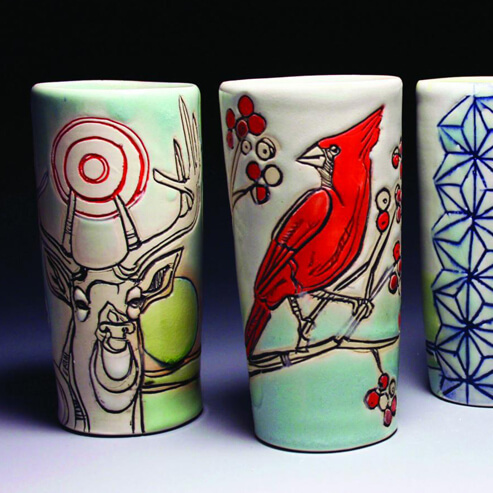 Ceramics has taken Noble to many destinations both nationally and internationally. Highlights for her include kiln-building at Good Hope Plantation in Jamaica and Studying Abroad in Oaxaca State, Mexico during Graduate School. Brooke’s work has been exhibited in many reputable galleries nationwide and published in a handful of books and periodicals. In addition, she enjoys teaching classes and workshops to both adults and children in the Adirondack communities of Saranac Lake and Lake Placid, NY. Noble is passionate about her surroundings, and values the social interaction of making and sharing a meal while taking part in the daily ritual of utilizing handmade pots, commonly made by someone she holds dear. My simple thrown forms beg to be activated with an array of images and vibrant color. Using line, language, image and pattern I create a balance between the narrative and the formal composition. By employing birds and other animals to act as metaphors, I can encompass several human conditions that often embrace humor and irony. Some of these ideas include the desire for social interaction, nurturing treasured relationships and the naivete associated with childhood. I ask that the entire pot be considered. Through interaction with my pots, decoration that would otherwise be hidden underneath the foot or inside the lip can be discovered. The situations I compose and the word play I often include solicits a viewer to give attention, contemplation and then maybe even a smile after realizing the less obvious one-liner left behind for one to ponder. Investing ordinary objects with a personal significance, I hope to inspire people to slow down long enough to enjoy the motions of sharing a meal, aware of the moment and conscious of the experience as a whole.